TrumpCasino.com was created back in September of 1998, making it nearly 19 years old. For the last few years, the domain name has been privately registered. Prior to the private registration, the domain name was registered to Trump Entertainment Resorts, Inc., according to a DomainTools Historical Whois record. Archive.org shows that this domain name had been forwarding to TrumpCasinos.com, which is also registered to Trump Entertainment Resorts. That domain name has not lapsed. I think this would be a very risky auction for anyone who wishes to monetize the domain name with advertising (or for someone who wants to sell the domain name). The Trump Organization seems to be aggressive when it comes to domain name protection. The company has filed numerous UDRP proceedings and has also reportedly sent cease and desist letters to domain registrants whose domain names may infringe on the Trump brand. I presume someone could own it and use it in a legitimate manner that allows them to express their opinion, but I think that could end up being much more trouble than it’s worth. Politico recently published an article about domain names owned by the Trump Organization. It seems like the company pays close attention to domain names, so it is surprising to me that this one expired and is up for auction. 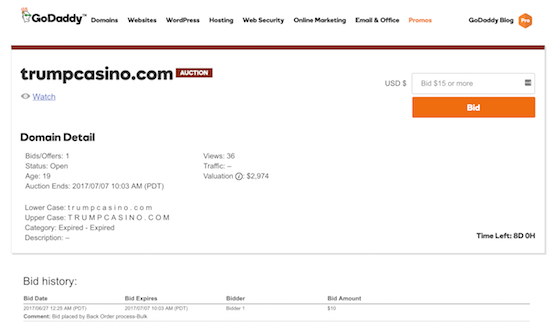 There are eight days remaining in the TrumpCasino.com auction, and the high bid stands at $10. Although I would imagine bidding will increase as the end date gets closer, I would be surprised if this domain name does not get renewed before the domain name goes through the full expiry period. Update: It looks like the domain name was renewed. Looks like the domain name was renewed and is no longer on auction.